Fun at Monterey/Big Sur/Ventana Wilderness! 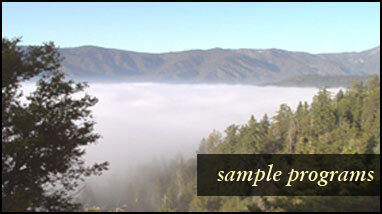 The unique environments of the Monterey Peninsula, Big Sur coast and Ventana wilderness set the tone for the Coastal Mountain Base Camp or Backpacking program. The experiential program allows students to learn as a result of direct, hands-on guided exploration through the ruggedly beautiful terrain of the northern Santa Lucia Mountains, the diverse flora of the Big Sur coast, and the tranquil beauty of Monterey Bay. This program can be an excellent introduction to outdoor living, push the limits of even the experienced backpacker, or a combination of both depending on the group’s desires. All of these landscapes are rich with activities that provide students with the opportunity to learn about an abundance of coastal mountain and marine ecology in addition to gaining new perspectives on the value of diversity and joy of supporting other people in their common endeavors. Under the guise of exhilaration and fun, the Peak Performance! Coastal Mountain program helps individuals gain insight into themselves by stretching personal boundaries and uncovering new strengths. Whether your group chooses the relative comfort of a base camp experience or the challenge of backpacking in the majestic mountaintops, Peak Performance! will be there to ensure that new discoveries endure and students derive the greatest possible benefit from their outdoor experience. Peak Performance!™ works directly with the school to identify and develop the content of programming by creating a curriculum that complements the school's goals for the Coastal Mountain Base Camp program. As a guide in framing a school’s program goals, we have outlined keys to Peak program effectiveness. Wilderness camping provides many types of learning activities in which students inevitably find themselves absorbed and deeply invested in outcomes- a perfect situation for learning. At the foundation of Peak Performance! ™ activities are skills crucial for group survival in nature as well as success in life--communication, problem solving, teamwork, appropriate risk taking and goal setting. Peak Performance! ™ programs emphasize significant, positive, lasting changes in individuals and communities. Depending on your group’s objectives and choice of program style, activities may include backpacking in the Ventana Wilderness, Coastal Mountain Day Hiking, exploring the Monterey Bay Aquarium, and kayaking on Monterey Bay or Elkhorn Slough. Your group might choose to participate in a Project and Service Learning program at Elkhorn Slough that promotes education, research, and conservation of the natural estuary. Students may literally get their feet wet at the Monterey Bay tide pools. Just as engaging is the Condor Project experience where students see and learn about the Condor as presented by the Ventana Wilderness Society. As part of this experience students learn how the condor population has been rehabilitated and are taken out on a natural history hike to see the condors soar freely above the Ventana mountain wilderness. Actual schedules may vary depending on total group size, length of program, and type of program but all major components can be in a rotation to accommodate your group’s specific objectives.